I have 8 year old Appaloosa mare which I owned for 4 years. She is a willing, easy going mare but a little on the spooky side though. I have just moved her from the farm she has lived on since birth (paid to board her there) to my place. I also have my friend’s horse stabled with her who was also from the same farm and was stalled beside her. My problem is she is kicking her stall. I’m at a lost at the cause. I thought the cause is out of frustration but not sure. She did kick her stall some at the farm too but not at this degree. I’m afraid she is going to hurt herself if I don’t figure out the cause. I can watch her go right into it. She will pin her ears back and tuck in her chin, back up to the stall wall then kick repeatedly. It can progressive get worse if left on her own vice until she’s satisifed. I’ve had to do repairs to her stall I know. I can prevent her from kicking if I catch her at the right moment. It takes several corrections but she will stop except I can’t be there everytime. If she allowed do it, she will kick up to 5ft to 6ft up the stall wall. I thought the cause was from frustration at being stalled at night but she does it when she allow to run in/out of her stall too. I haven’t been feeding her very much grain about 1/2lb a day but has free access to hay. I haven’t been working her too much to allow her to settle in. She has a acre paddock that she and the other horse to run in which she out in it at least 1/2 the day. Have any suggestions what I can do? Be sure the horse is getting ample exercise in the form of purposeful work. Be sure the horse is getting ample turnout time alone and with other horses if compatible and safe. Make sure the horse’s ration is appropriate for the level of work. 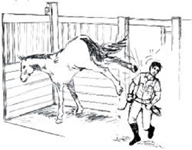 Check to see if there is an issue with neighboring horses, that is, if the kicking occurs when a particular horse is nearby. Since this is a mare, observe the occurrence of stall kicking in relation to her estrous cycle. Once you’ve evaluated the above and taken necessary measures, I’d suggest getting the mare back into her normal work schedule. I’ve posted an article on stall kicking on my website that might give you some more insight and ideas, but most of these repetitive behaviors disappear once a horse is given enough exercise and something else to occupy them. Best of luck. I’d like to hear how things progress with your mare and I welcome comments and suggestions from readers – just click on Leave a Comment at the end of this post. My miniature horse foal keeps biting, bucking, rearing and jumping up. He is a 4 month old foal. I plan to geld him, but our vet said to wait until he is 1 year, so it won’t harm his growth. Hershey wants to bite and chew on EVERYTHING. He has toys in the yard that he can play with, but I seldom see him using them. We have a pet goat who lives with him and his mother, and he is often seen chewing on her legs and tail (she has bite marks to prove it) I try to enforce the no-bite rule when I am around him by pushing his head away and tapping him on the muzzle, but when I leave for the day, there isn’t anyone to stop him. Also, when I turn my back to him, he will often run up behind me and rear/kick me. He also does this to his mother by jumping up and placing his hooves right below her withers. He is a very smart foal, catches on very easily and loves to please me. He let me take his halter on and off him at 5 days old and would move back and to the side with pressure too, but now he is so focused on biting or chewing on me that when I ask him to do something, he ignores my signals. On a different hoof, when his mother goes to roll in the dirt, she finds it very difficult because he jumps over her. I have often had to hold him still so she can roll, because I am worried that he will tangle his legs with hers. Is this a stage, or is it a habit??? And how would I be able to fix it and make him behave? Would gelding him early help? I am supposed to show him in showmanship this year. 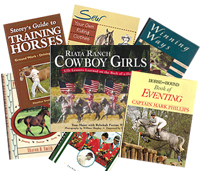 First I want to be sure that you know how to search here on this blog and on my website for information related to Biting and other horse behavior and training topics. You can also go to the article page on my main website www.horsekeeping.com where there are many more articles. On that page, you can see all of the articles by title, so the fastest way to find what you want is to go to the Behavior category and scroll down to the articles on Biting. Now, to your questions specifically. It is generally a stage that colts (male foals) go through. If a biting horse is dabbed at or played with, or if you lightly tap his nose to tell him no, in many cases it tends to encourage play biting which is a socially acceptable behavior between horses. You need to make sure your foal knows in no uncertain terms that you are top on the pecking order and biting is not an acceptable behavior. You also need to set up regular handling sessions so that he learns to respect your personal space. This means 2-3 sessions per day every day – the sessions don’t have to be long – they could be 5-20 minutes each but should be structured. The articles I suggest above and other articles on my website will help with that. As far as limiting his biting when you are not handling him or near him, that would be difficult. You can deter his biting of certain things like wood rails by coating them with a No Chew product, but that’s a big world out there, so while he is at this stage, perhaps teething, you should focus on his good manners when he is being handled and when you are near him when he is loose. In terms of gelding him, here is a thorough discussion of why a horse is gelded, when, and aftercare. You should follow your own veterinarian’s advice as to when to geld but do know that many horses are gelding “early” which means before they are a year old – even at weaning – with good results and no negative effects. I don’t want to advise you on that as I can’t see your horse. Your veterinarian has the best picture of your horses, management and so on. Best of luck and remember, there is no substitute for thorough regular effective handling.